There’s something surreal about traveling at night on the freeway. A bubble of greenish dashlight around you, outside the white lights come toward you and red lights convoy alongside. The multicolor lights of cities and towns pass quickly with the hot yellow roadlights of exits and overpasses standing like sentries. Away from the city it is only more intense. The desert night can be very black and the small hours of morning can bring fog so dense you’re tempted to drive by Braille, hitting the raised-dot lane markers you can’t see anymore with a satisfying tunk-tunk-tunk. Turn off the radio, you need to concentrate. Dial down the inside lights to cut the glare. Peer into the darkness. Somewhere, you see a white glow in the blanket of fog, a big rig approaching on the otherside of the median strip? Pea soup fog in the Bay Area, tule fog in the Central Valley — peanut butter fog in the Mojave, thick as a Dagwood sandwich; why are you driving in it? If you pull over and turn off your lights, you’ll be alone in a darkness so complete you’ll feel like a cave fish. Pull over and leave the lights on and you take the risk of someone rear-ending you, thinking you’re moving. Even leaving your emergency blinkers on won’t be safe; you’ve passed two cars doing that already and you didn’t see them till the very last moment. So you keep driving, slowing down, trying not to overdrive your lights. Then someone blows by you in a quad-cab dualie, doing at least sixty, seventy, maybe one hundred ten, you can’t tell. How fast are you going? You can’t tell that, either, you’ve got the dashlights turned off. Speed up a bit. If you hit the right speed, you won’t see anyone at all because you’ll all be going the same speed. The fog is so thick, you don’t even see the cotton candy lights of traffic on the other half of the road. You roll down the windows. The fog is cold, blowing in the window like frigid steam but it keeps you awake and you can hear the traffic on the other side of the road, when there is any. You can hear the dots on the pavement better, too. You turn the dashlights back on to check your speed. At forty-five miles an hour, it will take you three hours to reach the towns along the Colorado. Three hours of cold desert wind coming in the window, wet with fog. Three hours of peering into the darkness, wondering if there’s a car stopped in the road with its lights off, or a deer crossing the highway or someone trying to wave you down ’cause they have car trouble. Going slower would be intolerable, going faster would be insane. You memorize the sound of your current speed, the rhythm of the dots, and turn the dashlights back off. You drive. That was an exit. What did it say? Eagle Mountain? You’ve never heard of Eagle Mountain. You’ve driven this road in daylight and don’t remember that name. Are you still on the right freeway? There are no mountains here, just flat desert. Is Eagle Mountain a town? Would they have coffee? Too late now, you’ve passed the exit. You make a mental list of who you would kill for a cup of coffee. The list gets longer. Tumbleweeds appear out of the fog, like golden chandelier-spiders in your headlights, scuttling across the road. Alien-looking, it’s a Steven Spielberg sort of thought. Tunk-tunk. Tunk. One of the dots must have been missing. Lights up ahead. Is the fog lifting? You can’t be coming to a town yet, there are no towns on this freeway for another fifty miles. Someone with road flares? An accident or just a breakdown. You slow down and steer off the dots, not wanting anyone to see you doing that. The fog lifts suddenly, the immense desert opens up around you under hard bright diamonds in a jeweler’s showcase black velvet sky. The tension flows out of your neck and wrists and the open window is suddenly much too cold. You roll it back up. A road sign says, Blythe 70 miles. Less than an hour away and you won’t have to kill anyone for coffee, there’s a Denny’s there. Talk about surreal. But the lights in the road ahead of you — maybe you shouldn’t have been thinking of Steven Spielberg? Daniel is the artist on the webcomics I work on, Quillian and Sam Valentine. He’s also a sculptor of some skill. He did these beautiful little figurines of the characters Alistair and Zook from the strip I write and draw myself, Alistair2Zook. Click on the image to go to the online archive of the strip. Daddy’s brother, Uncle Virgil, dropped in on the New Years party that had turned into an Arkansawyer wake for Hank Williams. Naturally, the story had to be retold about the time he had shown up at Ma Dale’s and eaten two whole fried chickens all by himself, with biscuits and corn on the cob and buttermilk to drink. Uncle Virgil stood five-foot-five and weighed about 120 pounds but he was a legendary eater. He claimed he hadn’t come to eat this time but Pa and Uncle Charley snuck out back to wring the necks of a couple more fryers and Mom and Aunt Opal, the quiet sister, plucked the hens clean after dipping them in the scalding water kept heating in a big boiler sitting on one of the stoves on the back porch. Aunt Eunice, Uncle Virgil’s wife, was too pregnant to help in the kitchen so she sat in a rocker and told funny stories. She wasn’t a Dale or even the wife of one, being Mom’s sister-in-law but Ozark hospitality didn’t care. Her boys, Jimmy and Billy, disappeared out the back door taking Roger with them. The older boys played baseball in the stubble of a cornfield but they let the smaller ones who could hold a bat play, too. Both Robert and John would later go on to have Major League tryouts as pitchers but neither ever played professional ball. The older girls took over the front bedroom and talked about clothes, and babies and boys between bouts of helping out in the kitchen. Kay shuttled between the bigger girls and us littles, both groups probably boring the socks off her. The friends and neighbors and shirt-tail relatives that showed up were welcomed, even if they did push the mid-day meal back a couple of hours. Everyone wanted to talk about the man I kept thinking of as Uncle Hank and his music. 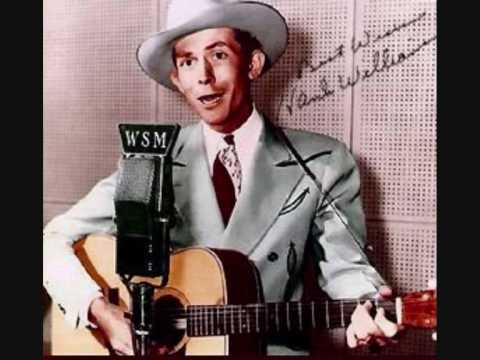 Hank Williams was a tragic figure, dead at twenty-nine after a hard life, poor health and bad habits. There wasn’t anyone there over the age of fifteen who did not understand poverty, pain, bad luck, bad choices and country music. They mentioned his son, Hank Jr., who was just about my age and whom I would later meet, in the late 60’s, and tell him about the New Years party where I thought his father must be a relative of mine since everyone I knew cried so hard when he died. The radio played Hank Williams tunes all day and the adults sometimes sang along, especially when they played, “I Saw the Light.” My own favorite Hank Williams song at the time, “Kawliga,” about a lonesome wooden Indian came on frequently, too. I also liked the nonsense sound of “Jambalaya” and the one about howling at the moon. Nearly sixty years later, I still know the words of most Hank Williams tunes. The front porch and living room became where people sat and talked about “Uncle Hank”. The cane-bottom chairs were arrayed across the wide front porch with the older people given preference for seating. But Pa and Uncle Charlie and a few other of the old men preferred to “hunker”, sitting on their own heels. Pocket knives came out and mounds of “whittlin’s” grew around the old men as sticks and small chunks of wood disappeared. The whittlings were carried inside and dumped into the steel box used to store kindling for wood fires. Ma Dale and my mom and aunts cooked on a big kerosene stove in the kitchen and another older wood-fired oven sitting next to the more modern appliance. Ma tested the heat in the ovens by seeing how fast the hair on the back of her arm would curl, even though the kerosene stove had a built-in thermometer. Pa Dale and my Daddy had cut up logs from the little ten-acre woods behind Pa’s farm back in the fall and they were stored on and under the back porch. Some of the boys who got pulled away from the baseball game to carry the wood inside to fire the oven complained about spiders. Ma scoffed. “It’s winter, the spiders are all asleep,” she said. Still, sticks and wedges of wood were thoroughly thumped against the ground or the porch to dislodge any sleeping spiders. It would be bad luck for an Arkansawyer to burn up a spider in a cookfire, everyone agreed. I took it to heart and have always been careful not to kill a spider unless it was necessary. Two or three older kids were detailed to pump and carry water and were kept busy at this task. The pump was on the back porch, too, along with a small bucket that always had to be kept full of water in case the pump lost its vacuum and needed to be primed. The line at the old two-holer outhouse behind the chicken coop grew and a few people trekked the quarter-mile to the next farmhouse to use an inside toilet rather than risk splinters after a long uncomfortable wait. If you weren’t moving around much, it got cold outside just standing because it was, after all, January and only a week before the place had had one of Missouri’s chief weather-related joys: a Christmas icestorm. The heat from the kitchen and the coal-burning stove in the living room and a bright if mild winter sun led to piles of coats and scarves and sweaters in the front bedroom. We littles wanted to play in such an inviting and colorful assemblage but we were told that we couldn’t so we had a pillow fight with the bigger girls instead. Anyone who couldn’t wait for the meal to be ready was given a slice of raw potato, peeled and washed, to gnaw on. Aunt Ava passed out pieces of “tater” to all us littles and we nibbled and crunched and chewed and wondered why no one ever served this delicious treat except when dinner was going to be late. I can still taste the sharp, slightly bitter tang that got sweeter as you munched away. The radio stayed on in the living room while we ate dinner in every room of the house. It wasn’t a particularly cold day for early January but too cold for us kids to eat outside on the back porch like we did in warmer weather so we ate in the extra bedroom with planks laid across the feather bed to serve as a table. A few months before, Mom and Dad and I had slept in that same bed. We finally had chicken and biscuits, gravy and potatoes, corn and peas, collard greens and bread and butter pickles, apple cobbler and gingerbread cake — the meal went on for hours that first day until we littles were tucked away on pallets in the back bedroom a few hours after sunset. But not before each of us had a small helping of ham and black-eyed peas, even if we hated black-eyed peas, for luck in the new year. Better luck than poor Uncle Hank had, anyway. Mom taught me my letters and how to sound-spell and I would puzzle out some of the shorter words, getting good enough that with my supply of imagination, a lot of people thought I could read. By the middle of the following summer, before my fifth birthday, I really could though I still needed help with some of the harder words. A few things happened before that next birthday that I particularly remember, though. The biggest was probably that Hank Williams died. Mom, Dad and I and about forty aunts, uncles, cousins, neighbors and friends were at Ma and Pa Dale’s for a New Years Day feast. Uncle Charley, Pa Dale’s eldest brother, was there. I described Pa Dale earlier as looking sort of like a taller Stan Laurel playing Jed Clampett. Uncle Charley looked like Benny Hill dressed for pickin’ and grinnin’ and he clowned for us little kids with all the enthusiasm of Pee Wee Herman. He would get down in the floor and wool us around like a big dog and we would laugh until some of us needed diapers changed. He’d pick us up in his mouth by the back of our bibs and carry us around while we squealed and giggled. He was about to turn 76; he still had all of his own teeth, but only a little fringe of white hair around his ears. Pa was a clown, too — pulling faces, telling stories complete with silly voices, and making toys for us from old spools; dollies for the girls and little tractors for the boys. He and Uncle Charley both got down in the floor and pretended to bury us in the linoleum. Pa had false teeth so he couldn’t do the trick with carrying us in his mouth. In the middle of this hilarity while getting ready for the big festivities, somebody came in, I think Uncle Ross, my Mom’s brother, and told everyone that Hank Williams had died. The big radio in Ma and Pa’s living room was turned on and everyone had to be quiet while the grownups who had been sitting on the front porch in cane-bottom chairs chawing terbacky and dipping snuff listened to the news. Hank Williams, the biggest star on the radio, had died in the back of a Cadillac while being driven from one show to another. The women cried and the men looked solemn. I started to cry, too. “Was he Mr. Williams or Uncle Hank?” I asked. Everyone seemed so upset I thought he must have been a relative I hadn’t met yet. There were four of us cousins less than six years old but old enough to walk and talk. We had rooms full of grown-ups ready to spoil us when Uncle Hank had to go and die and put a damper on the party. Brenda, Roger and I were all born in the same summer only weeks apart. Roger’s sister Kay was six and had started first grade a year early at five by following her older brother to school and refusing to go home. So she sort of counted as a big kid to us. Roger’s little brother Bill was two and talked around the fooler in his mouth. A fooler is a baby’s pacifier, binky, or maggie, if you’re wondering. Bill looked like a miniature Uncle Charley, complete with fringe of white hair around his ears, except that he didn’t have all his teeth yet. He was a smart little guy though and had already become locally famous for a few zingers. And even with very few teeth, he could bite like a snapping turtle and so had our respect. Bill’s actual name was Roland, and his brother Roger was usually called Bud. Their oldest brother, Robert, was called Robert, though, presumably to avoid confusion. Their mother, Aunt Ava, had a Mississippi drawl as broad as the river, along with blue-eyed blonde cheerleader looks and a bouncy, good-natured enthusiasm that didn’t seem to go with being a mother of four at the age of 25. My mother and my Aunt Myrtle probably distrusted Aunt Ava’s flatlander origins and her roping their brother Ross into marriage to a teenager but they traded barbs and quips with her exactly like they did with each other. Aunt Myrtle had clearly inherited her sense of humor from whatever strand of ancestry had supplied Uncle Charlie’s; she had the kind of earthy humor that might suggest plugging an electric blanket into an unlikely place if the power went out. Mom had a quick sarcastic turn of phrase like a Katherine Hepburn character; but Aunt Ava could hold her own with a sly grin, a wink, a giggle and an occasional zinger of her own. She was Bill’s mother after all. They all worked in the big farmhouse kitchen beside Ma Dale, a tiny woman with her hair up in a bun. If she let it down, it would lay on the floor for almost three feet and it stayed black for more than sixty years. Ma’s own grandmother had taught her some rather German twists on things like spice cake, egg noodles and potato pancakes. She cooked with enthusiasm and skill and liked nothing much better than a lot of people to show up and eat what she had prepared. She knew how to handle a passel of daughter and daughter-in-law helpers but people kept arriving on hearing of the death of Hank Williams and the frying of Ma’s chickens along with the pans of cornbread, biscuits and cobbler, the pots of beans, black-eyed peas and cream corn, and the plates of winter vegetables like onions, potatoes and turnips. Thirty or forty people had been expected but the feast grew to more than seventy and went on for two days, with another day just for clean-up. I’m not sure how long we stayed with Ma and Pa that time, not more than a few months I’m sure. 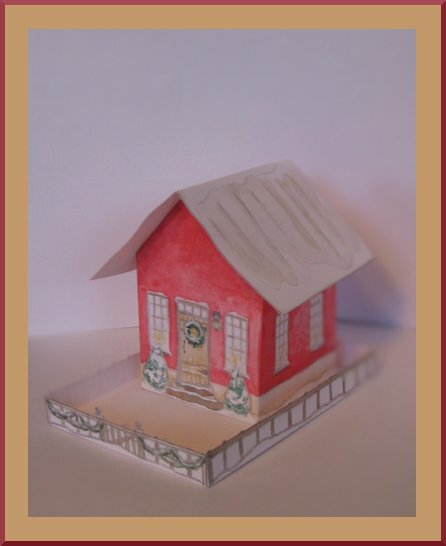 We moved into a house in town that wasn’t much more than a shed for a short time and then into a place I called The Little Red House. It had asphalt siding made to look like red bricks and it sat between the schoolhouse and The Big Red House where another bunch of cousins lived. When we moved in, no one had lived there for more than a year. The place was surrounded with tall dead grass from the summer before and bright green short spring grass. The grass stood taller than my head and several of my older cousins took turns carrying me on their shoulders so I would not get lost in the undergrowth. My father and uncles used brush whips and sickles to cut the grass short enough to use lawnmowers which my Uncle Ross, the father of Robert, Kay, Bud and Bill, brought over in a pickup truck. One was a gas-powered machine with two heads on a five-foot wide platform that he had borrowed from the church-owned cemetery across the road. It made an incredible racket which we little kids pretended was a monstrous giant from a fairy tale. The other two or three machines were reel-type push mowers and not so terrific for play-acting. Uncle Ross also brought along my first dog, a white feist, or rat terrier, with one enormous black spot on its back. Naturally, the dog got named Spot after what he left in the kitchen floor. That first day, Mom and my aunts cleaned the house with buckets of hot water and soap, exclaiming about spiders and worrying about snakes being driven indoors by the men cutting the grass. A railroad house it was called, kind of like a shotgun house except that the front and back doors did not line up so if you fired a shotgun in the front door it would hit a wall before it got to the back door. It had only three rooms and we lived there less than two years almost sixty years ago but I still remember it well. All this while we lived with Ma and Pa and after we moved into The Little Red House, Daddy went to Cape Giradeau or Jonesboro or Memphis most weeks to work as a carpenter. He’d leave early Monday morning and get back late Friday night and he’d bring back the Sunday paper with him to look for work the following week. If he worked somewhere close by, like Senath or Kennett, I’d go with him and sit and play with blocks while I watched him work. He’d even take me up on roofs with him, in a little playpen-platform he made that would perch on the comb of a roof. I would sit in the little platform for hours and use the wood blocks to tell stories about princesses and horses and friendly giants that were actually my Daddy’s folding carpenter rule. Daddy hated for me to play with the rule he finally bought me one of my own, his was yellow and mine was white. Daddy’s brother, Uncle Virgil, with Aunt Eunice and my cousins Jimmy and Billy had moved into The Big Red House about a quarter-mile away. Aunt Eunice was pregnant and very ill so if I wasn’t gone with Daddy on one of his jobs, Mom and I spent most of our time taking care of Jimmy, Billy and Aunt Eunice. Around this time, I discovered comics. Daddy brought home the Sunday paper every week and I remember lying in the floor looking at the comics in the paper and begging someone to read them to me. Also, Jimmy, already in the second grade, had comic books — Donald Duck, Mickey Mouse, Joe Palooka, Superman, Archie, Little Audrey and Little Lulu — and would read them to Billy and me. But the newspaper funnies my father brought home were my favorites. Maggie and Jiggs, Blondie with Cicero’s Cat along the top, Thimble Theater with Popeye and O.G. Wottaschnozzle, the Cap’n and the Kids and all the other colorful adventures in the papers kept me enthralled even if no one would read them. I’d look at the pictures and make up my own stories. I also got the Little Golden Books that were full of picture stories frequently. I had one I remember called Rootie Kazootie, Baseball Star. I had no idea that Rootie Kazootie was a television show. I’d never seen a television when I first got the book. But what an exciting story the book told. 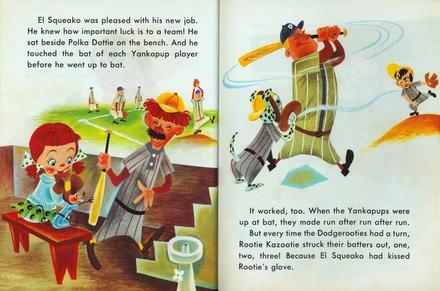 Rootie was a pitcher for the Yankapups but the evil Poison Zanzaboo had stolen his Magic Kazootie, and kidnapped his girlfriend Polka Dottie too, and brought bad luck to the team. And they had to play the Dodgerooties in the World Series! How could they win without Polka Dottie to cheer them on and Rootie playing his Magic Kazootie to bring them luck? Crisis was averted when it was discovered that Polka Dottie’s little mouse friend, El Squeako, the famous catador, had a magic touch that took off jinxes. His plan foiled, Poison Zanzaboo gave back the Magic Kazootie and took Polka Dottie to the game where she could root for her boyfriend. Poor Zanzaboo had to sit there next to Polka Dottie and just boo while Polka Dottie and El Squeako cheered for the Yankapups, who naturally won. I know I have misremembered the story because this whole book is online and you can find and read it too. If you look for the story, you’ll see that Rootie Kazootie threw a mean knuckleball. But I like my version just as well, it’s probably the one I made up before I could read the book! Amazingly, the artist of that Little Golden Book is still alive in 2011. His name is Mel Crawford and for the last forty years he’s drawn for Sesame Street, among other things. You could look him up, as they say in baseball. Because of Rootie Kazootie, for a long time I thought the World Series was a game played every year in New York between the Yankees and Dodgers. And for three out of four of those years, it was; the one exception being when the Giants took the Dodgers place. I was really excited in 1956 when the evil Dodgerooties decided to move to California to where we had just moved back to, though I would have rather it had been the good guy Yankapups. We moved back to Senath, Missouri, midway down the western edge of the Bootheel sometime in 1952. Both sets of grandparents lived there and aunts, uncles and cousins; too many to shake a stick at, as the saying goes. My mom’s parents, Emma and Francis Dale, were known as Ma and Pa to all the grandkids, probably because of the Ma and Pa Kettle movies. They lived in a farmhouse about four miles out of town. We stayed with them for a month or three after moving back from California. Ma was a tiny, dark-haired lady of German and English ancestry, distantly related to Robert E. Lee by family legend. In recent years, I found out that this was indeed true, just as it was true that my father was related to the James Boys. You have to go back almost to when the first boat landed in Ma’s case and nearly to the American Revolution in Dad’s but the connections were there. Odd how such things survive orally when the documentation to prove it is rather difficult to dig out. Pa was a tall man who looked a bit like a bald Stan Laurel dressed as Jed Clampett. Stan was a particular hero of Pa’s and he would often do his impression of the famous comic. To me as a child, it was just something funny Pa did and it wasn’t until twenty years later I recognized it for what it was when my brother did the goofy smile and hand over his forehead from behind and I couldn’t tell if he was doing Stan or Pa. They lived in a wide wooden house on the edge of some property they leased for farming. There were only four rooms, each very large. The toilet was an outhouse out beyond the chicken coop, water came from a pump on the back porch and baths were taken in galvanized steel tubs with water heated on a wood burning stove. Mom and Dad used the back bedroom and I slept either with them or with Ma and Pa in the front bedroom, or lying on a pallet in the living room, “parlor” if cousins were also staying. Uncle Ross and Aunt Ava lived down the road about a half a mile and their three youngest often stayed with Ma and Pa, too, either all in a group or one at a time. Kay was two or three years older than me and very smart. She had started first grade at age five by simply running away from home to follow her older brother Robert to school and refusing to be sent back. She had flaming red hair, bright blue eyes and one enormous freckle that covered her entirely with tiny patches of bright pink skin showing through. She made a good role model for a little girl when she wasn’t being too bossy. Roger, called Bud, was her middle brother, two weeks older than me, exactly. Roger didn’t talk much, his three siblings and both parents being all chatterboxes, he probably couldn’t get a word in edgewise. He stood half a head taller than me, a sturdy physical sort who took it upon himself to show me how to hide in the corn rows, or under the house, or in the grain bin or the root cellar. Hiding was fun with Bud but sometimes we got into trouble. Not too much trouble, we were only three and a half. Roland was the youngest of this batch of cousins. At less than two years old, he had only just started walking. He talked, though. He talked a lot and most of it was funny. For a toddler, Bill, as he was called, had a sly streak and a clever way with words. Still in diapers, he had an accident in Ma and Pa’s bedroom. Not wanting to find an adult to change him, Bill cleaned his own diaper out and left the detritus on a crocheted cloth rug beside the bed while he went on with his playing. Bill stood up in the middle of the floor and started out of the room. “Pa,” he said as he left quickly on his chubby little legs, “I ‘spect some cat done crept in, crapped and crept out.” He made his escape while Pa laughed and laughed and laughed. It was great having the cousins stay over but my favorite mornings during this time were ones when I’d wake up alone in whichever bed I had climbed into the night before. My father, if he had carpenter work, would leave before daylight and get back after dark, this was in the winter. My mom would go to the fields with Pa, digging and clearing for the spring crops to be put in, if Daddy was gone. Or she would milk the cows, a task she enjoyed and was good at. Ma would stay around the house, cleaning, baking, tending a winter garden, pumping water, mending clothes and feeding the chickens. The garden was on the southern side of the house, near the pump and the backsteps onto the porch and into the kitchen. Ma knew she would hear me when I got up but for kids on a farm, it’s never too young to show a little self-reliance. I would get up, use the thundermug if I needed to and wash up in the basin of warm water next to the stove. Then I’d go into the kitchen and open the lower cupboard next to the long dark oak buffet. Inside this door I knew I would find a homemade biscuit, all fluffy and crumbly, and a slice of ham, bacon or fatback on a small green glass plate sitting on top of a tiny green glass bowl of oatmeal with a pat of butter melting in it. 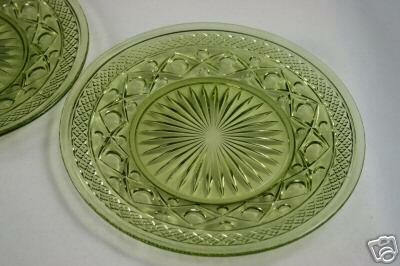 The plate and bowl both came from inside boxes of Quaker Oats at the time, as did the green glass of milk I knew I would find in the icebox. It was a real ice box with ice brought by an iceman two or three times a week. Ma and Pa had a refrigerator, too, but fresh milk from your own cows tastes better if it is kept in the icebox; refrigerators are too cold. I would get my own spoon from the lower drawer of the buffet and I would climb up and stand on one of the sturdy oak chairs to eat my breakfast on the table. I felt very proud. I even put the sugar from the sugar bowl on the oatmeal myself. 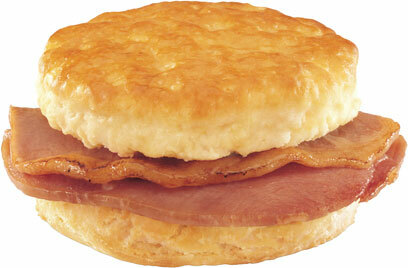 The biscuit and cereal were warm, the milk cold, the meat salty and sweet. I don’t think any meal in my life ever satisfied as well and I ate like that three or four times a week whenever I stayed over. Ma always came in from outside before I finished and she always asked, “Did you get enough to eat?” She’d fuss with me, straightening my clothes, moving me to a different chair that would hold the booster seat Daddy had made, or kissing me extravagantly on the ears until I giggled. Then she’d have a task for me like sorting buttons while she sewed or feeding the chickens while she worked in the garden. It was a great time and place to be a little kid. Aunt Grace and Uncle Herman lived in Casa Grande, a small city southwest of Phoenix, Arizona. Back in 1951 it was a place of cotton farms and cattle ranches. Aunt Grace was Mom’s second oldest sister, a plump cheerful woman with black hair and a house full of kids all older than me. Uncle Herman was a big Oklahoman with a booming voice and a call to the ministry. I’m not sure if he had a church in Casa Grande that time but when he wasn’t preaching he worked on farms or in the construction business. There were other cousins in the general area, too. The Arkie and Okie diaspora of the twenties and thirties had spread the hill clans all over the West, especially Arizona, California, Oregon and Washington, all of which were developing rapidly and needed people. Wages were high because there were never enough workers. Like in a lot of cotton-growing areas, when the cotton crop needed work — planting, weeding or picking — everybody jumped in and worked at it. Buses would bring people from other areas, even Mexico, to work in the fields and the state and federal governments co-ordinated things so that the cotton crops in different areas didn’t all need work at the same time. Picking time was August in Missouri and Arkansas and got later as you went west, as late as January in some parts of California. I remember it being spring and summer in Washington but it must have been September by the time we got to Casa Grande because everyone was working in the cotton fields bringing in sacks of white gold. Mills in the eastern states were trying to clothe a nation and the world and they needed lots of the stuff. The cotton farmers offered pay so high that my parents delayed going on to Arkansas after our visit with Aunt Grace and Uncle Herman and stayed to pick cotton at good wages. I even had a tiny little cotton sack and went to the fields with Mom and Dad. Workers were paid by the pound but when I would get a little cotton in my bag, I would go to the water wagon and crawl under it to sleep with my head on the pillowy sack. I liked to lay there and watch the grown-ups and bigger kids work. There were lots of kids near my age to play with and it was lying in the dirt under the wagon where I first learned some Spanish from my Mexican and Indian playmates. I don’t think I realized it was a different language, just a different way of talking. The wagon was made of old wood and rusty iron and had several big sideways metal barrels full of water with house-style faucets for turning them on and off. One barrel had a drinking fountain as well as a faucet. Because of the dripping water, the cottonwood trees it was parked under, and the big mass of the wagon, things stayed cool underneath even when the temperature got well over 100 degrees. Fall weather in Casa Grande is still warm compared to fall anywhere else. Most of the men wore denim overalls or khaki trousers and long-sleeved cotton shirts with straw or felt hats. The Mexicans, both immigrants and Mexican-Americans, tended to wear bigger hats. My father seldom wore a hat, he had a lot of perfectly-combed, curly, black hair and a hat would mess it up. The local Indians usually wore white or gray trousers instead of khaki. A number of black people dressed pretty much like the whites. The young men of all of the groups would sometimes take off their shirts to work, probably as much to show off for the girls as to stay cool. The women worked in the fields right alongside the men. Some of them wore dresses but usually they wore bib overalls. Mom wore khaki pants under a thin dress to protect her legs from the sharp edges of the cottom plants, as did a lot of other women and girls. Many of them would quit work in mid-morning to prepare lunch then back to work in the afternoon and quit earlier than the men in the evening so they could go home and make dinner. Kids of all ages either helped pick cotton or played around the edges of the field, or like me, sat in the shade and watched. Some of the women actually picked cotton while carrying a baby at the hip. This was boom time and good money could be made. The Mexicans and Indians ate refried beans and tortillas with hot chili peppers for lunch. They drank water with their meals. The whites and blacks, almost all of whom were from Arkansas, Oklahoma, Missouri or Texas, ate cornbread, pot beans, fried squash, sliced onions and drank lots of iced tea when they could get it. Some of the men drank beer and a few of the kids had sodas. Cotton bags were weighed when full and at the end of the day and someone recorded the weights. Wages were paid daily in cash at a little table under the trees lining the edge of the fields. I don’t know how much they were paid per pound but Mom and Dad were happy that they were earning more than they had in Wenatchee or in almost any other sort of work they had ever done. Wages were four times as much as similar work paid in Arkansas or Missouri. Picking cotton is hard labor and I took frequent breaks under the water wagon where I probably cemented another one of my nicknames. My cousins called me “Doodlebug” because I liked to play in the dirt, digging holes and making lines and shapes with sticks. A doodlebug is an ant lion in Arkansawyerese. Still, I did pick some cotton. All told, in three weeks, Mom later told me that I earned thirty cents. Not bad money for a three-year-old in 1951, I suppose.